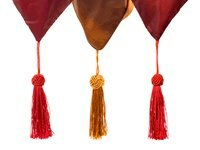 Dating as far back as ancient Egypt and China, the tassel once served to show -- and show off -- status, learning and wealth. Until recently, many viewed them as quaint, old-fashioned decorations, but they are seeing a resurgence in popularity on curtains, pillows and clothing. Adding a tassel to your knit hat brings a whimsical and personal touch, setting it apart from everyone else’s plain, boring head topper. Tassels and their cousins, pom-poms, are simple to make, and you can even use up scrap yarn or thread to create them. You need: A piece of lightweight cardboard twice the length of the tassel and about 3 inches wide Yarn to match or complement your hat Scissors A crewel or other large-eyed needle. A square or rectangle cut from an empty cereal box works well for this project, -- you need to be able to fold the template in half. If you don’t have cardboard handy, you can wrap the yarn around your hand. Fold the cardboard template in half so it's the same length as the finished tassel will be. Cut a 10-inch piece of yarn and center it inside the fold. This will simplify tying the tassel later. Next, hold one end of the yarn aligned at the fold. Wrap the yarn around the cardboard to the desired fullness -- usually 20 to 50 wraps, depending on the weight of the yarn. End the wrapping at the fold, and clip the yarn. Bring the ends of the string inside the fold together and tie them loosely. Slip the bundle off the cardboard; pull the tie tight, and make a knot. Cut the loops at the other end of the tassel. Finish your decoration by wrapping another piece of yarn around the bundle tightly, between 1/2 and 1 inch from the top, and tying it with a double knot. Trim the ends to even them, but leave the top tie -- the one that was in the fold -- long. Thread one of the long tails into the crewel needle and stitch the tassel to your hat. Weave that end of the yarn into the stitches on the hat. Then thread the other tail into the needle and stitch the tassel and hat together for extra security. Weave the ends and trim, if needed. If you want something shorter than a tassel, a pom-pom will do the trick. Cut a square of cardboard about twice as big as the desired diameter of your pom-pom. Cut out a square from the center; you only need about an inch on the inside. Wrap the yarn around the outside of the square to the desired fullness. Tie a piece of yarn tightly around the center of the bundle through the square you cut inside. Cut the loops on each end open, and then trim the pom-pom to even out its shape. Attach it to the hat the same way you did the tassel.